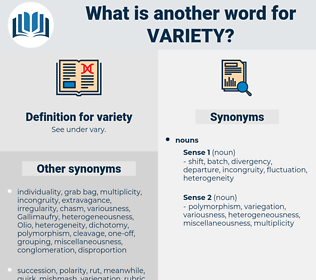 What is another word for variety? types, divers, obtentions, Patents, different, varying. Classifications, differences, Selections, reactions, waves, Stories, sorts, backgrounds, types, divers. series, variation, myriad, heterogeneity, panoply, versatility, type, combination, crowd, difference, lot, disparity, raft, variance, palette, varying, continuum, patchwork, set. multiplicity, multitude, diversity, assortment, plethora, plurality, variability, wide-range, cross-section, gamut, range, breadth, mix, differential, wealth, host, quantity. steadiness, identity, persistence, fixity, paucity, homogeneity, unchangeableness, permanence, homogeneousness, fixedness, continuance, firmness, invariability, fewness, constancy, likeness. There were carpet - bags here not only in large numbers but in great variety of form and size. The fruit of this variety is bright golden - yellow. taxonomic group, taxon, taxonomic category.